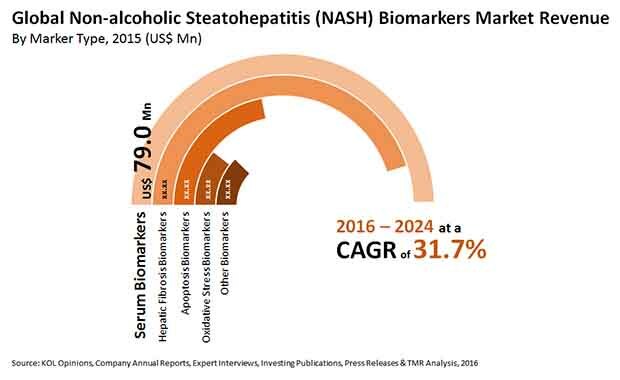 The global market for non-alcoholic steatohepatitis (NASH) biomarkers features a highly competitive vendor landscape, with leading companies capturing sizeable share in the global market owing to their patented markers, observes Transparency Market Research in a recent report. As the treatment cycle of NASH is long, routine monitoring regarding the progress of the treatment is crucial, demanding use of methods such as liver biopsies. However, the vast limitations associated with liver biopsy in NASH patients have compelled companies in the market to develop non-invasive diagnostic methods for NASH monitoring. Additionally, collaborations of biomarker-based diagnostic tool providers with companies capable of validating the accuracy and efficacy of diagnostic tools during clinical trials is a popular trend in the market. Transparency Market Research states that the global NASH biomarkers market will exhibit an impressive 31.7% CAGR over the period between 2016 and 2024, reaching a valuation of US$1.7 bn by 2024 from US$201.2 mn in 2016. Of the key types of biomarkers available in the global market, including serum biomarkers, hepatic fibrosis biomarkers, apoptosis biomarkers, and oxidative stress biomarkers, the segment of serum biomarkers has achieved significant popularity among healthcare practitioners over the years. The segment dominated the global market in 2015, accounting for the leading share in terms of revenue contribution. Over the report’s forecast period, however, the segment of hepatic fibrosis biomarkers will lead in terms of prospective rate of growth, at nearly 38% CAGR. The overall demand for hepatic fibrosis biomarkers will benefit from the increased realization regarding their high efficacy and accuracy. In terms of geography, the Europe market accounted for over 50% of the global market in 2015, followed by North America. Europe is expected to retain dominance in the market in the near future as well, exhibiting a remarkable 30.8% CAGR from 2016 through 2024. North America is also expected to continue to hold a significant share in the global market owing to the established NASH healthcare sector in the region. The significant rise in the rate of incidence of non-alcoholic liver diseases across the globe is the key factor to have increased the magnitude of research and development activities in the field of non-alcoholic steatohepatitis biomarkers in the past few years. Over the next few years, the vast patient pool of type 2 diabetes, which is more prone to liver conditions such as non-alcoholic fatty liver disease (NAFLD), will emerge as a key factor driving the NASH biomarkers market. Other factors, including the rising air pollution, sedentary lifestyles, and unhealthy eating habits will also drive the global NASH biomarkers market in the near future. Most of the NASH biomarkers and panels used by researchers and healthcare practitioners fail to present results with high accuracy and sensitivity. As observed in received operating characteristic analysis, the accuracy of most biomarker panels available in the market is around 0.80 - a factor that could hinder the overall growth prospects of the market by compelling consumers to prefer alternative therapeutic and diagnostic solutions for managing NASH. Moreover, the fact that diagnostic results produced by some NASH diagnostic markers overlap with disease indicators for other metabolic diseases, such as diabetic hepatosclerosis and glycogenic hepatopathy, questions the reliability of the available NASH diagnostic biomarkers in the global market.